Belgium international Eden Hazard has said that he has already decided on his future, although he has refused to disclose whether he would be signing a new contract with Chelsea. The 28-year-old has flirted with the prospect of joining Real Madrid over the past year and this has increased the speculation regarding his future with his contract expiring in 17 months' time. 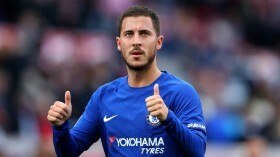 In an interview with RMC Sport, Hazard has acknowledged that he has already made the decision regarding his future but refused to highlight whether that would see him remain with the Blues for the long-term. Hazard has once more been the standout performer for the Blues this season and he has contributed 12 goals and 10 assists for the club in the Premier League alone. His exploits have helped the Blues maintain the fourth position in the standings for most of the season but they still face pressure with Manchester United and Arsenal behind them by two and three points respectively.